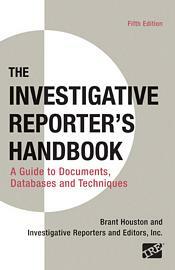 Macmillan Higher Education: Investigative Reporter's Handbook Fifth Edition by Brant Houston; Investigative Reporters and Editors, Inc.
Brant Houston (University of Illinois at Urbana-Champaign) , Investigative Reporters & Eds. "This book is as close to a class as there is in investigative reporting. Nothing else comes close."